Windows Explorer (and other file managers) can display a different icon for each folder. Customization can be simplified by specialized tools, but every folder can be also customized manually using resources available in default Windows installation. All versions of Windows since '95 allow users to customize the 5 standard icons: My Computer, My Documents, Network Neighborhood, and Recycle bin (empty and full). These icons are best changed from the Windows Control Panel. The values are set to path to a file with icon and the index or identifier of the icon inside the file. Normal folders are folders made by users and root folders of hard drives, USB memory sticks, DVDs, CDs, floppies, etc. These folders can be customized by placing a Desktop.ini file to a folder and marking the folder with the read-only (system) attribute. IconFile entry specifies the file with icon. It may be by an .ico file or an executable file (.dll, .exe, .ocx, .icl, ...) with multiple icons. The IconIndex field is used when the file contains more than one icon. If the value is greater or equal to 0, it specifies a zero-based index of the icon inside the file. If it is less than 0, the absolute value specifies icon's identifier in the executable file. There is no documentation from Microsoft on this entry, but it seems to override the previous icon specification on Vista and combines the two values in one. If you are customizing a folder with this entry and if you want to use your own icon, you should delete this line. The Desktop.ini file should have the hidden and system attributes and it may already exist in a folder. 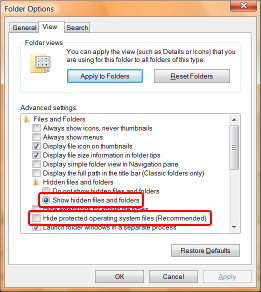 To display hidden files, go to Folder Options (accessible from menu or the Organize button in Explorer on Vista). Then let Explorer show hidden and system files as shown on the screenshot by the . The Desktop.ini file may contain other entries, which are not related to icons. Explorer needs to be notified about the change to reflect it. Log out an in again. That's nice, but to old as for me. I'd mostly prefer using kinds of software. FolderMarker or smth. Direct editing of "desktop.ini" files is the best and simpliest way to customize common folder.. It's very intuitive and You always know, what You do.. against of unknown tool, what are suspiciously big and untrustworthy.